UMT OER-Alumni Office engaged UMT Alumni for brainstorming session regarding Alumni Executive Body formation on March 7, 2018 at UMT Campus. The evening was graced by Senior Alumni Executives from SBE, SEN, STD, SPA & SSH. Rana Iftikhar Ahmed, Director External Relations, chaired this meeting. After the recitation of Holy Quran, Senior Manager Alumni Affairs presented the working of alumni office and the initiatives taken in recent years. Later on, an open house brainstorming session started with the circulated agenda. The participants were very enthusiastic and showed their keen interest to best serve their alma mater. This reunion highlighted and proposed ideas for better connectivity through regular alumni engagements, and to determine a focused group of alumni who have a keen sense of responsibility in offering their services and time on voluntary basis. Alumni are considered as great role models for current students and are often well placed to offer practical support to students as they start their careers. They can provide students with great job opportunities or find prospective clients for businesses. 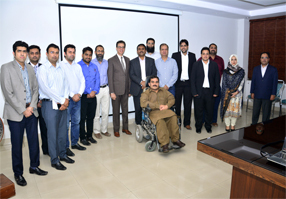 The suggestions comprised of the refresher courses / one-day workshop for alumni to upgrade themselves, inviting alumni as guest speakers to share their corporate experience, creation of Data Research Center and UMT Alumni Club. Everyone in the meeting acknowledged the efforts of UMT- Alumni Office in connecting and engaging alumni on regular basis, and advised to introduce their core functions right in the beginning when students are enrolled in different programs.The session ended with the word of thanks by Rana Iftikhar Ahmed with the consensus of another more focused and purposeful meeting. A group photo was taken to capture these moments of reunion. A lavish dinner was also served to the distinguished alumni.